In the last four years, I've read biographies of three giants among America's Founding Fathers. Each in turn has forced me to change the way I had always seen these individuals. I had this to say after reading Walter Isaacson's "Benjamin Franklin: An American Life": "I had pigeon-holed Benjamin Franklin into a caricature of the man, the author of too smug, too pat bromides like 'Early to bed, early to rise, makes a man healthy, wealthy and wise.' Walter Isaacson's biography reveals a breadth and depth to this man, a sense of his importance in shaping the character of America, that it's impossible for me not to join Team Franklin." I had this to say after reading Joseph Ellis's "American Sphinx": "This biography covers [the heroic] Jefferson, the one on Mount Rushmore, but it also reveals a less flattering Jefferson. On balance, it caused me to abandon my place on Team Jefferson." 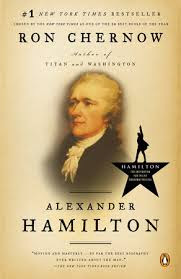 Now, Ron Chernow's biography "Alexander Hamilton" gives me appreciation for Alexander Hamilton, whom I had long demoted because I used to favor Thomas Jefferson and knew of the Jefferson/Hamilton feud. It turns out I should have been on Team Hamilton all along. Jefferson fares just as badly here as he did in Ellis's work, being petty, vindictive, hypocritical, and a champion of slave-holders, states' rights, and the bloody excesses of the French Revolution. Hamilton, on the other hand, is revealed as the indispensible Founder. Chernow's biography reveals two Hamiltons. The first was the young immigrant who by his genius and industry became George Washington's indispensible aide during the Revolutionary War. Washington was so impressed that he chose him as the first Secretary of the Treasury, which in the early days of the Republic, when the government was so small, meant that he effectively ran the government. And because he was the first Treasury Secretary, it also meant that he effectively created America's government. As Chernow says, "In contriving the smoothly running machinery of a modern nation-state—including a budget system, a funded debt, a tax system, a central bank, a customs service, and a coast guard—and justifying them in some of America’s most influential state papers, he set a high-water mark for administrative competence that has never been equaled. If Jefferson provided the essential poetry of American political discourse, Hamilton established the prose of American statecraft." But Chernow also reveals a second Hamilton, a darker one, one he sank into in the latter years of his life. Jefferson and his followers, Madison and Monroe, never liked Hamilton's vision of a strong central government. As long as Washington was around and backed Hamilton, Hamilton could counter the Virginians. But when Washington stepped down and was replaced by John Adams, the Virginians felt freer to attack Hamilton. Then Hamilton had a personal falling out with Adams, too, a man of Hamilton's own Federalist Party. Hamilton was politically adrift. Worse, Hamilton had fatal character flaws that served him well when young, but doomed him in maturity. Chernow describes him as "a fearless, swashbuckling intellectual warrior who excelled in bare-knuckled controversy." Two events marked his later life. The first took his reputation, the second his life. Despite having a wife and family that he genuinely loved, he conducted a reckless affair with a married woman. The woman and her husband then blackmailed Hamilton. Hamilton believed so strongly in his ability to explain away any controversy that he published a long pamphlet admitting to the affair but denying the parallel charge of using his Treasury position to financially benefit himself. Legally, his argument made sense, but politically, his career was ruined. Then, in trying to ruin Vice President Aaron Burr's own political career, Hamilton ended up triggering a duel with Burr in which he lost his life. What we're left with is the puzzle of a man who could be brilliantly incisive about some things and stubbornly obtuse about others. Chernow does an excellent job explaining the mentality at work in this giant of the American Founding Fathers. And he was a giant. Chernow says, "In all probability, Alexander Hamilton is the foremost political figure in American history who never attained the presidency, yet he probably had a much deeper and more lasting impact than many who did."